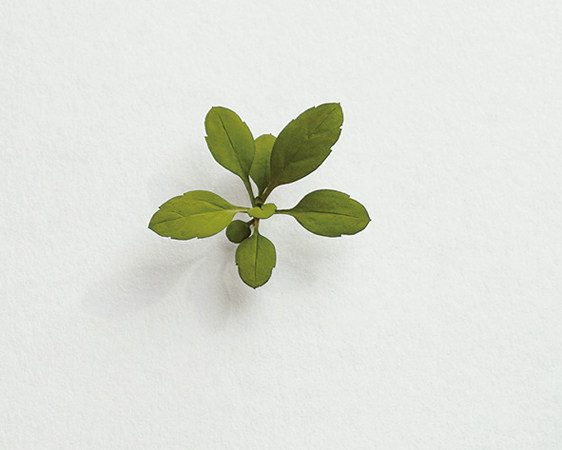 Suda Yoshihiro, Weeds, 2013. Painted on wood. © Yoshihiro Suda. The Faggionato Gallery is delighted to announce their forthcoming solo exhibition of the Japanese artist Yoshihiro Suda. The exhibition, Suda Yoshihiro, showcases his hyperrealistic wooden sculptures of plants and flowers. The nature of the environment or gallery space is central to Suda’s creativity. For Suda, the sculptures are ‘interventions’; subtle additions to an existing space or display. Each sculpture is only half of the work of art—the other half is their installation. The element of surprise is core to Suda’s work. In October 2000, he installed interventions at the Buddha’s Smile exhibition at the Okura Museum of Art in Tokyo. The sculptures were placed into the display cases, causing visitors to take second glances. Similarly, upon entering this exhibition, visitors will initially question whether or not they have overlooked something. The startling realism of each sculpture demands closer inspection, even though the viewer is already aware that in the gallery environment it is unlikely that there are real plants growing out of the walls. This merging of the boundaries between reality and illusion creates a surreal sense of the ordinary becoming the uncanny. Suda developed his interest in carving plants as an undergraduate at Tama Art University in Tokyo in the early 1990s. This was a time when contemporary art was primarily conceptual and the notion that art could be decorative or aesthetically pleasing was largely ignored. Suda felt troubled by this and wished to create works of art that were unique and yet did not require any knowledge of contemporary art theory. Indeed, Suda’s self-taught sculptural techniques blend traditional carving practices with modern concepts relating to the role of art in daily life. He is influenced by the idea of continuing in the tradition of Japanese Old Master sculptors, while his decision to elevate and display such mundane objects as plants and weeds challenges our preconceived notions of what is a ‘work of art.’ These sculptures revive traditional notions of beauty and craftsmanship in art, inviting the viewer to observe more closely the seemingly insignificant ornamentation that can be found in the everyday. Born in Yamanashi, Japan, Suda lives and works in Tokyo. In 1992, he received his BA in Graphic Design and has exhibited internationally in numerous solo and group shows. Recent museum shows include the Chiba City Museum of Art in 2012, The Manggha Museum of Japanese Art and Technology, Krakow, in 2011, Asia Society Museum, New York, and the Contemporary Museum, Honolulu. In 2008 his work was included in Out of the Ordinary at London’s Victoria and Albert Museum. His work has been exhibited extensively in group shows in the USA, Japan, Germany, Australia and Quebec. His work is held in numerous international public and private collections, including The National Museum of Modern Art Tokyo; Leeum Samsung Museum of Art, Seoul; The Art Gallery of New South Wales, Australia; The Israel Museum; National Gallery of Canada; Neues Museum, Nurnburg Germany; and the New Art Gallery Walsall, Birmingham. For further images and information please contact info [​at​] faggionato.com or T +44 (0) 2074097979.